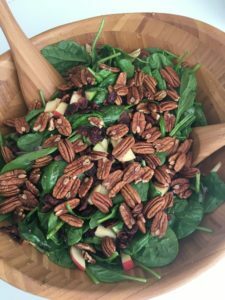 An amazingly delicious fall salad with apples, pecans, and spinach that everyone will enjoy. *Use all organic ingredients whenever possible. Add dressing ingredients into a small container with a lid. Shake vigorously and set aside. Add 1/2 of the dressing to the spinach and toss until fully mixed. Continue to add dressing and toss until desired preference. Add apples, cranberries, and red onion. Toss ingredients together. Top with raw pecans and serve.